The phrase refers to the idea that a butterfly‘s wings might create tiny changes in the atmosphere that may ultimately alter the path of a tornado or delay, accelerate or even prevent the occurrence of a tornado in a certain location. The flapping wing represents a small change in the initial condition of the system, which causes a chain of events leading to large-scale alterations of events (compare: domino effect). 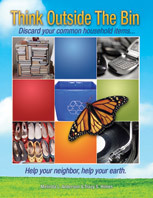 If we can apply the butterfly effect to our daily recycling habits, the landfills may just disappear in our lifetimes. Think of all the parks we can add! This entry was posted in Benefits of Recycling, Landfill statistics, planet earth, Social Recycling, Think Outside The Bin and tagged Butterfly effect, butterfly effect on recycling, landfill stats, social recycling, think outside the bin. Bookmark the permalink.